Oahu, Hawaii (Feb. 14, 2018) – On the heels of its spectacular VIP grand opening sneak-peek ceremony on February 13 – Morimoto Asia Waikiki at the stunning ʻAlohilani Resort Waikiki Beach– officially opens its doors to the public tomorrow, February 15 at 5 p.m.
“We are committed to providing exceptional cuisine and an unmatched dining experience to our guests and are thrilled to have Chef Morimoto’s Morimoto Asia as our resort’s signature dining experience,” said Matt Grauso, General Manager at Alohilani Resort. Last night’s high-energy celebration for more than 250 invited guests featured culinary presentations from Iron Chef Masaharu Morimoto that included breaking down a sustainable, line-caught, 125 lb Hawaiian big eye tuna (courtesy of Garden & Valley Isle Seafood, Inc.) in the resort’s O Bar that was used as part of a 60-foot long maki roll, which was then cut and served to party guests. Chef Morimoto received help from nearly 40 of the event’s guests in making the sushi roll, including Kathryn Teruya, Miss Hawaii 2017, Julieanne Chu, Miss Hawaii USA 2018, Pualani Armstrong, Miss Waikiki USA and Letty Fierro, Miss Diamond Head USA. 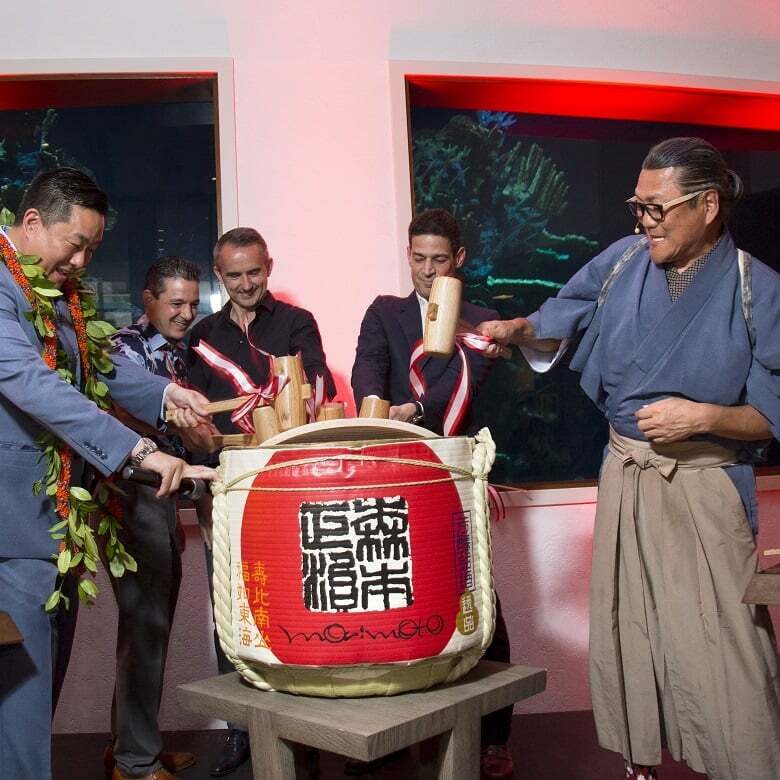 Festivities also included a sake barrel ceremony, where Chef Morimoto, Morimoto Asia Waikiki’s General Manager Chase Heu, Highgate Principal Vann Avedisian, and Vice President of Construction Paul McElroy cracked a sake barrel and filled traditional masu with sake to share with guests in a celebratory toast. Following the commemorative toast and rolling of the sushi, Members of the Hawaii Lion Dance Association joined the party and performed a festive show complete with drummers and two Lions. 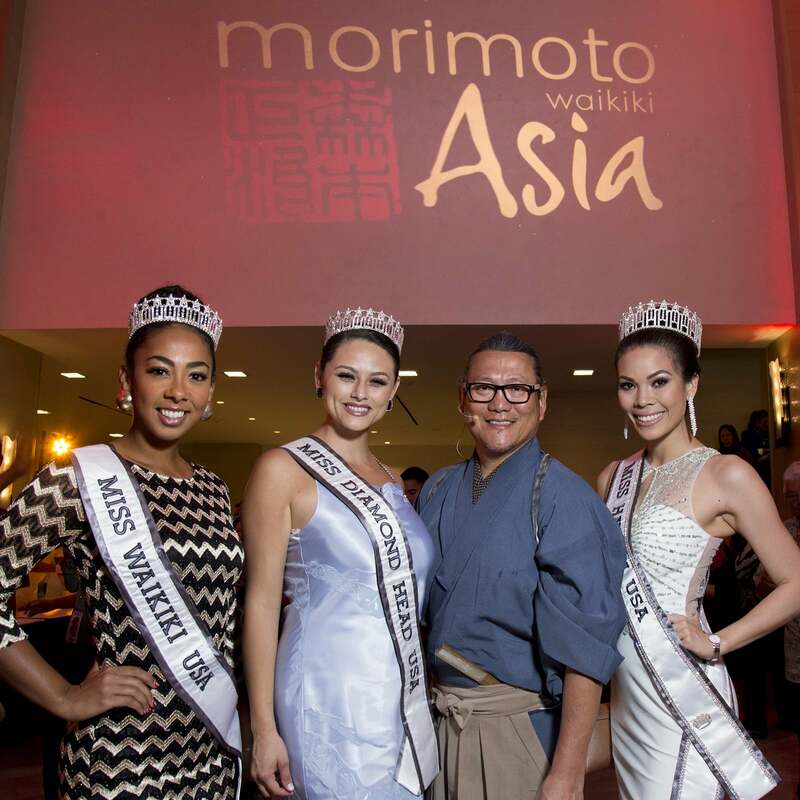 The Lions, along with Chef Morimoto, Highgate, and ʻAlohilani executives, then led guests upstairs to Morimoto Asia Waikiki where Chef Morimoto and Chase Heu fed the dragon red envelopes and greens for good luck and prosperity. View and download VIP grand opening images HERE. The vibrant restaurant showcases Chef Morimoto’s unique take on Pan-Asian cuisine, fused with flavors and techniques inspired by his world travels. Signature dishes include Jellyfish (yuzu soy, ginger, garlic, chive, tomato), Morimoto Peking duck (carved house-roasted whole duck, served with steamed flour pancake, apricot sweet chili and hoisin miso), Ishiyaki Buri Bop (hamachi seared table side, pickled daikon and carrot, royal fern, egg yolk, sweet ginger soy), Angry Lobster (Maine lobster, rice noodle, Thai red curry sauce), Washugyu Ribeye (shallot Szechuan sauce, scallion mushroom sauté), plus a selection of rice + wok dishes, dim sum and sushi rolls. The beverage program highlights more than 20 types of sake including two different flights for those looking to explore a variety of options; plus shochu, Asian whiskey, scotch, wines, draft and bottled beer and signature cocktails including Lycheetini (Smirnoff vodka, Iichiko Shochu, Soho Lychee Liqueur, lychee water), Hawaiian Revival (Kikori Whiskey, Cointreau, Sudachi Shochu, yuzu, absinthe) and Vitamin Sea (Sauza Silver Tequila, li hing mui, lime juice, Cointreau, agave, guava juice). The 10,800 square-foot restaurant is Chef Morimoto’s second Morimoto Asia location (Disney Springs at Walt Disney World Resort). Chef Morimoto is also set to debut Momosan Waikiki at ʻAlohilani Resort Waikiki Beach this spring. More information will be announced as it becomes available. Morimoto Asia Waikiki opens tomorrow, and then daily for dinner service starting at 5 p.m. For more information on the restaurant visit www.morimotoasiawaikiki.com or call 808-922-0022. For more information on ʻAlohilani Resort Waikiki Beach visit www.alohilaniresort.com or call 808-921-6196. ʻAlohilani Resort Waikiki Beach is managed by Highgate, a premier real estate investment and hospitality management company.